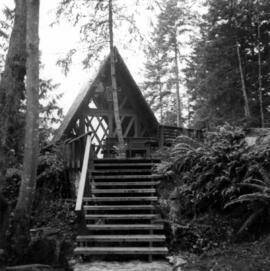 Church of His Presence in Halfmoon Bay, Sechelt. 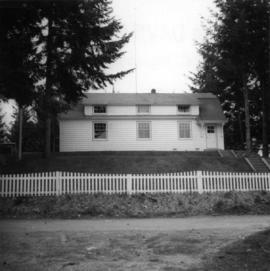 Photograph depicts the church of His Presence in Halfmoon Bay, Sechelt. 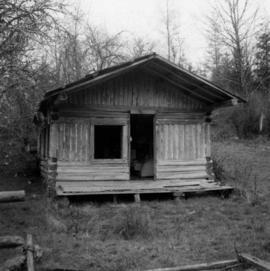 It was built in 1962 by Cannon Greene, a former seafaring minister of the Columbia Coast Missions and the subject of a C.B.C. T.V. 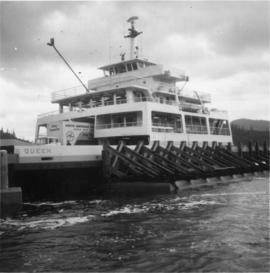 production in early April 1966. 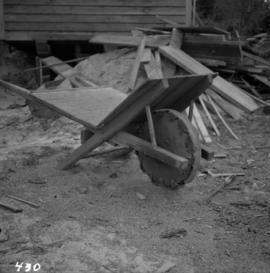 Photograph depicts a homemade wheel barrow with a leather covered wheel. 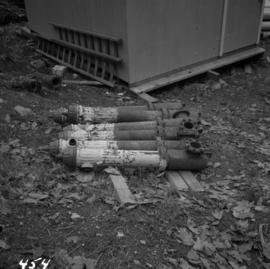 It was outside an old timer's shed at Porpoise Bay, Sechelt village, on the Sechelt Peninsula. Roman Catholic church "Our Lady of Lourdes" in Sechelt, B.C. 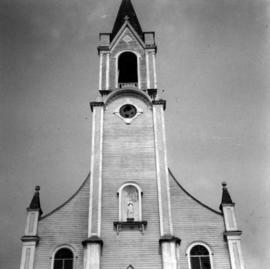 Photograph depicts a Roman Catholic church, "Our Lady of Lourdes," on the First Nations reservation, Sechelt Village. It was built in 1907 and is now closed, but the heavy bell is still in position in the belfry. St. Hilda's Anglican Church in Sechelt, B.C. 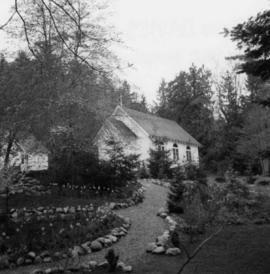 Photograph depicts St. Hilda's Anglican Church in Sechelt on the Sechelt Peninsula. Tall tree on left just coming into flower is a dogwood. 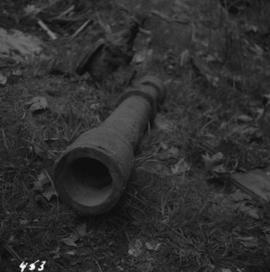 Photograph depicts a 3ft section of wooden pipe bound with wire, fitted to a metal 'T' piece with valve. Internal diameter approximately 4-5", while the facing end is approximately 6". It was recently taken out of service.